At 6am, Mark’s internal clock wakes him up. Starting work early has three advantages: the cooler temperature still allows a decent level of concentration, office hours in the US and Europe are way ahead, and he doesn’t have me around to distract him. An hour or so later, I join him at the table to do some work on the computer as well, after having a look outside to appreciate the beautiful surroundings. Mid-morning, we have a small breakfast and then, it is back to our computers, or we do boat chores or run shore errands. It is already very hot and nothing can be done without sweat streaming down our faces, whether we are inside the boat or outside in the cockpit or on land. After a late lunch, we feel lazy, but napping is not our thing, so we try to read, write emails or relax a bit, before it is shower time. We jump in the ocean around 4pm, when it is still hot enough to enjoy our “bath” and our towel has time left to dry outside. Sometimes we swim to the beach and back for some exercise, or, on a cloudy day, we go for a little walk to collect fruit. At 5pm the day is mostly done and we have a glass of yummy juice with a little snack, while we prepare and cook an early dinner. By 7pm, we are in bed. It is dark – the relentless sun finally gone - and we enjoy a TV show or a movie on the laptop. Mosquito netting keeps the buzzing creatures out. 9pm is bed time, and after a night with many interruptions because of rain, wind gusts, visiting cargo ships, noise on shore or waking up in sweat, the cycle starts over again. Fridays are different. Mark drops me off in the town of Fare, where I try to sell some unneeded household items and make a bit of money for the evening happy hour at the Yacht Club - the happening place in French Polynesia. Sometimes, we grab a bite to eat as well, or we meet new friends, like last Friday, when Melissa and Scott invited us over for a fun evening on their boat Kaimana. Our last bottle of Tequila was put to good use, something we “regretted” the following day! During this monotonous life in the tropics, we are surprised and inspired by the “special events” that occur once in a while. On the evening of Mardi Gras, our friends Marie and JP invited us over for traditional French crêpes on their boat Domino, and Chinese New Year was celebrated with fireworks in Fare – something that was absent here on December 31st. One morning, I rented a bike and pedaled up to the marae of Maeva. This time, I followed a hiking trail up a hill to see some different ruins. It was a pleasant walk, mostly in the shade, but the humidity was high in the jungle. To cool off, I biked to the edge of motu Ovarei and snorkeled the coral garden, which held some pretty surprises. The ride back at noon was brutal without any shade, but at home, more refreshing salt water awaited! 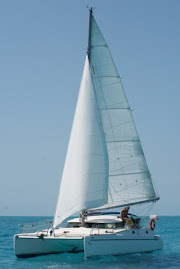 On the weekend, we moved Irie back to Avea Bay, to celebrate Mark’s birthday and to prepare for our sail back to Tahiti. You are making me miss FP (although I am happy to miss the tropical summer :-). So looking forward to getting back to Island life and snorkeling! Happy Birthday to Mark!